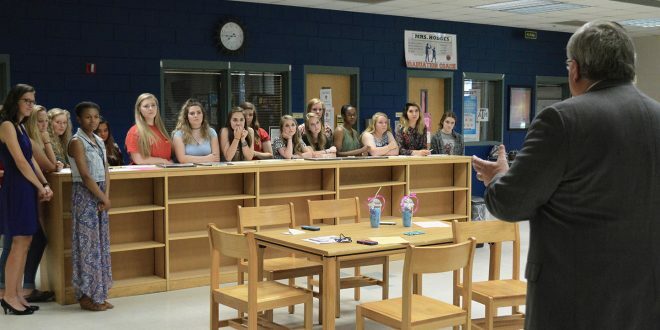 AUGUSTA, GA. – High school students across the state of Georgia celebrated their academic accomplishments and collegiate intentions at Georgia Future Educators Signing Day on May 17. Click here to view a photo album of the events. Georgia Future Educators Signing Day is a statewide initiative sponsored by the Georgia Department of Education that recognizes the achievements and commitment of our state’s high school students to pursue higher education programs that focus on P-12 education careers. “For many years, College Signing Day was associated with students signing athletic contracts, but a commitment to make a difference through future career choices should be given as much attention and recognition as excellence in athletics,” said Dr. Judi Wilson, associate dean of the Augusta University College of Education, which co-hosted a signing day celebration at Evans High School from 7:30-8:30 a.m., at Washington-Wilkes High School from 8:15-8:45 a.m. and Greenbrier High School from 1-1:40 p.m. In Georgia, high school students who participate in the Education and Training career pathway option enjoy partnerships with industry and institutions of higher education to ensure they have the skills to thrive in their college major or in the work force. They may even earn college credit for their work. According to Stanford University researchers, only five percent of students indicate on the ACT that they plan to pursue a career in education, but 60 percent of teachers work within 20 miles of where they went to high school. “Georgia is experiencing a shortage of new teachers, and every student who makes a commitment to teach the next generation should be celebrated and honored. By supporting these students, we’re making a commitment to quality education in our own communities. We are making a difference by growing our own future teachers.” Wilson said. Click here to view a photo album of the events.